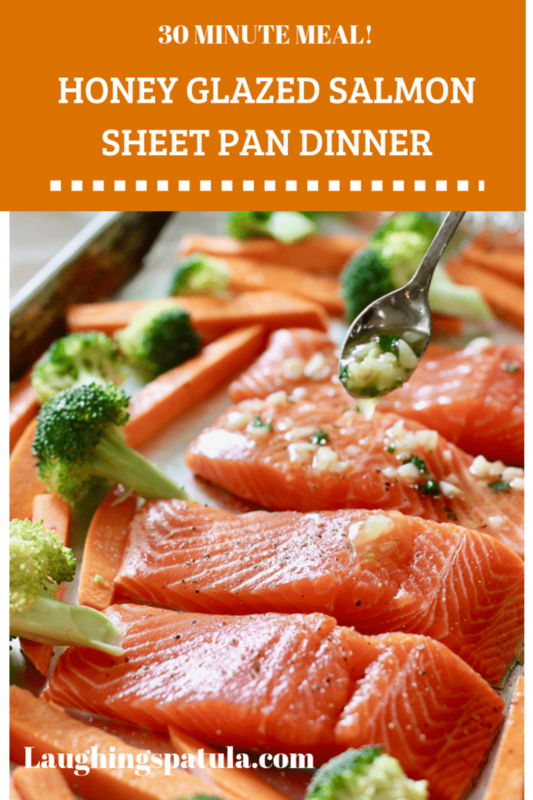 This easy to make Honey Glazed Salmon Sheet Pan Dinner is Fast, Fresh and Easy to make. Bonus point: HEALTHY! It is the perfect weeknight meal but flavorful enough for company. Another installment of handy dandy sheet pan dinners. This one might be the best one yet! You can see more of our Sheet Pan Dinner creations on our Pinterest Board here. We have been using this sheet pan method for years. Just didn’t realize it was a ‘method’. 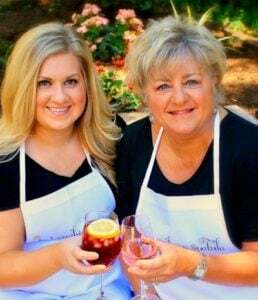 It’s just how we cooked! You throw stuff on a sheet pan and bake it. Hardly the work of a master chef. More the result of a lazy cook…that would be me. But I love good food so this method is perfect! We buy these big old sheet pans at Costco. 15 x 21…and they are cheap, cheap, cheap. Honestly I don’t think they are five bucks. And if you line them with foil or parchment, they will stay all pretty and shiny for a very long time. We love pretty and shiny :). Line a large sheet pan with foil or parchment for easy clean up. You will be glad you did. Slice up your salmon in equal fillets. Skin on or off is fine. I like to cut my sweet potatoes like french fries. Because, well, I love french fries! But you can cube them as well. Keep them relatively small like 1/2 inch so they finish at the same time as the broccoli and salmon. Time to mix up a bit of melted butter, garlic and some honey. Add a tablespoon of grainy or smooth dijon if you like. We used broccoli for the veggie but you can sub asparagus, quartered brussels (again you want them to get done quickly with the salmon to keep them small cut), or even small cauliflower florets. Keep an eye on your broccoli – I like mine crispy but if it gets a little brown for your taste, just pluck it off the sheet pan with your ploonkers, (aka: tongs). I have always called tongs ploonkers. Merlot was most likely involved there….sometimes I am so funny. Hiccup. Sub regular potatoes for the sweet potatoes. Cube instead of fry shape if you prefer. If you want to keep this Paleo or Whole30 compliant. Simply brush the salmon with olive oil, salt and pepper leaving out the honey. Or use complaint butter such as ghee. Loving this sheet pan dinner thing? Check out our most popular recipe for Sheet Pan Fajitas! Or my personal fave, Greek Chicken Sheet Pan Dinner! Chop up the leftovers for the most delish salad for lunch tomorrow! Time to get creative with your sheet pans! Please post pics! 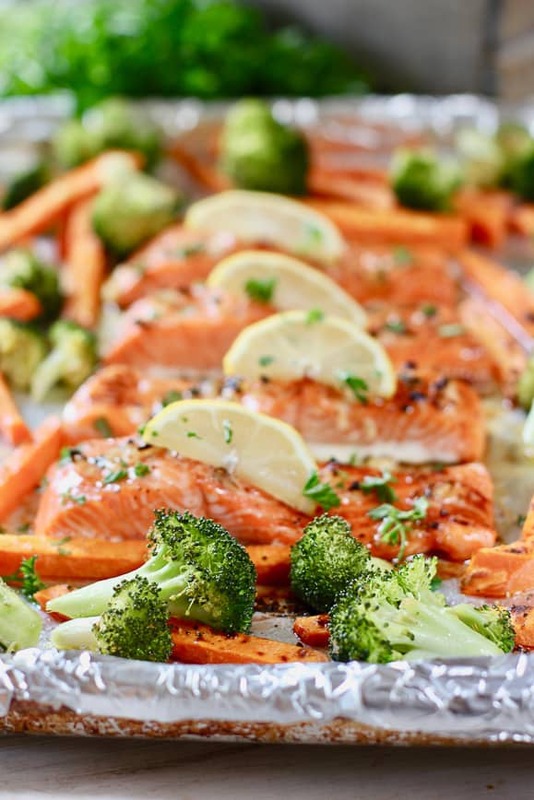 Salmon, veggies and sweet potatoes all cooked up on one sheet pan! This is a perfect weeknight meal. Checking all the boxes: Protien, check. Veggies, check. Healthy Carbs, check! Line large sheet pan with foil or parchment. Slice salmon fillet in 3" wide pieces. Peel and slice sweet potato in spears. Cut broccoli into large florets. Toss broccoli and sweet potatoes with 3 tablespoons olive oil, salt and pepper. 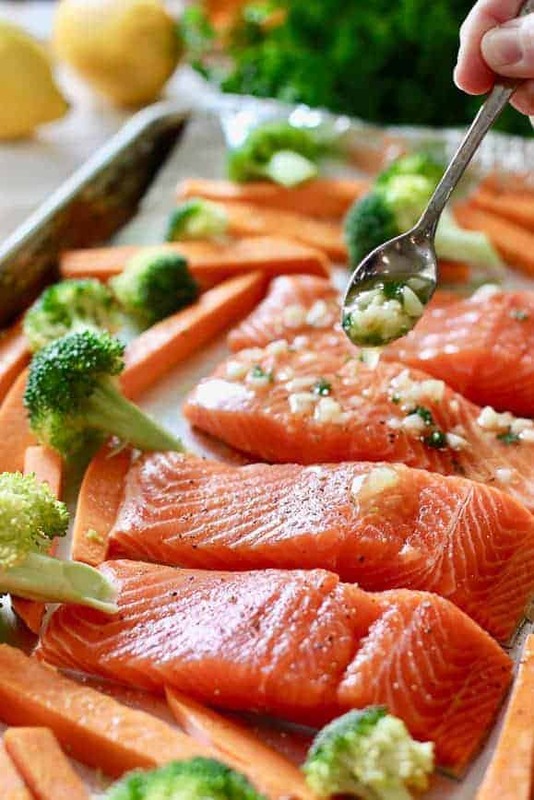 Place salmon on sheet pan and surround with broccoli and sweet potato mixture. In small bowl, combine honey, butter and brown sugar . 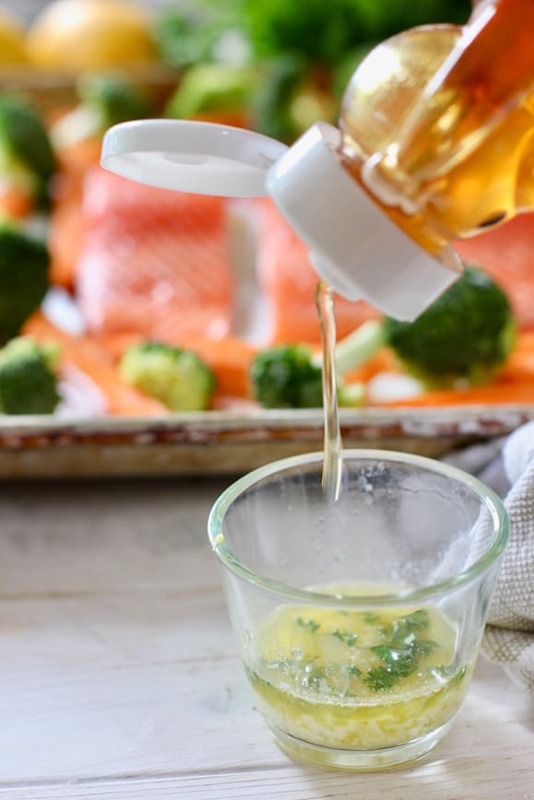 Brush or drizzle onto salmon fillets. Bake for about 25 minutes until veggies are tender and salmon is cooked through. 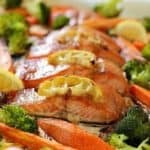 NOTE: if broccoli is browning too much for your liking, simply use tongs to remove and set aside until salmon is fully baked. 6 Weight Watcher Freestyle Points (2 ounces sweet potatoes). Keep an eye on your broccoli - I like mine crispy but if it gets a little brown for your taste, just pluck it off the sheet pan with your ploonkers, (aka: tongs). I have always called tongs ploonkers. Merlot was most likely involved there....sometimes I am so funny. Hiccup. How much would one serving be? Hi Jill – one pound salmon fillet divided by 4 would be a 4 ounce portion of salmon. Absolutely delicious! Always looking for ways to make fish dishes more interesting! The flavors come together so well in this dish. Loved it! This recipe sounds interesting . My husband and I prefer steelhead trout so we’ll be trying that instead. Looks fabulous, and such a healthy meal too!